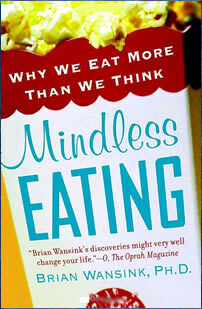 Mindless Eating is a book written by food psychologist Brian Wansink that explains why we tend to overeat. According to Wansink, your mind makes more than 200 decisions a day related to food, mostly without your conscious awareness. In this book he provides information that will help you to become a mindful eater and to make healthier choices. This is not a traditional diet book because there are no meal plans, recipes or recommended lists of foods. Brian Wansink has spent a lifetime studying the factors that influence why and how much food people eat. His purpose in writing this book is to reveal the hidden elements that can trigger overeating. Wansink exposes some of the tricks used by food companies, grocery stores and restaurants that cause us to eat more than we need. These can include deceptive food labeling, larger size packaging, enticing smells, color and music. A range of scientific research related to human eating behavior is summarized. The author describes an experiment where people were given a “bottomless” bowl of soup that was slowly and imperceptibly refilled. This tricked the subjects into consuming much more than they thought. In one trial a bottle of wine was relabeled, fooling the participants that the meal it was served with was of higher quality. And in another study the amount of M&M’s consumed varied depending on the number of colors made available. By slightly reducing your portions you will be able to reduce your caloric intake without feeling deprived. You can serve 20 percent less food at meal times, using a smaller plate so that you don’t notice anything different. You can also fill up half of your plate with salad or vegetables. And instead of storing foods in bulk, separate your snack items into individual portion size bags. Wansink emphasizes that it takes time to gain weight and a few extra calories here and there can add up gradually. This is what he refers to as the “mindless margin”. You have the power to eat mindfully by increasing your awareness whenever making a decision about food. The book provides many practical strategies to help you achieve this goal. This book does not recommend specific foods other than general advice to eat more salads and vegetables. Mindless Eating: Why We Eat More Than We Think retails at $15. Click Here to purchase Mindless Eating for a discounted price. Increases awareness about food choices and eating behaviors. Includes unique information about the reasons why people overeat. Encourages an increased intake of vegetables. Does not contain a meal plan or recipes. Many readers will require more guidance to successfully lose weight. Mindless Eating provides insight into the various reasons why you may overeat and will increase your awareness about your eating behaviors. Practical strategies are provided to help you avoid excess calories without feeling deprived so that you can effortlessly lose weight.